Specimen 18cm x 14cm The 4mm hexagonal crystals contrast against a dark siliceous ironstone matrix. 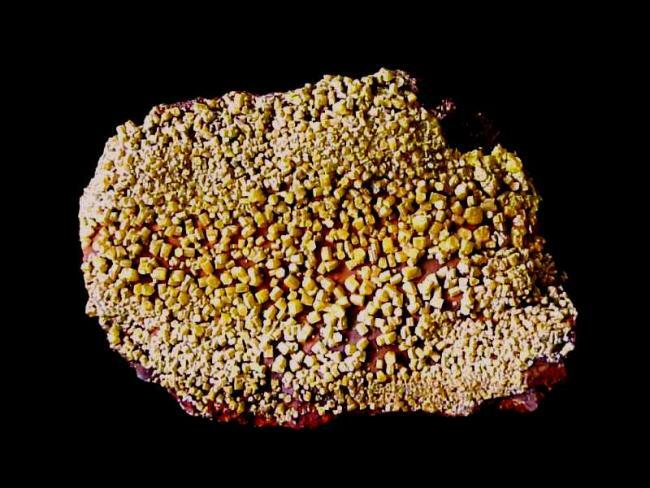 This specimen of Pyromorphite, a variety of Lead Phosphate, was collected in the Black Star Open Cut, Mt Isa North-West Queensland in 1975. Large vughs lined with pyromorphite formed along fracture planes in the host rock. The openings were liberally sprinkled with masses of the yellow-green crystals.